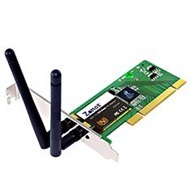 The Zonet ZEW1642 - 802.11n Wireless PCI Adapter delivers an incredible speed to your desktop PC without running wires. It complies with the IEEE 802.11n [Draft 2.0] standard, making it backward compatible with 802.11b/g networks for assured compatibility. Advanced 128-bit WEP encryption is supported to provide secure access for your data. Once you're connected, you can stay in touch with your email, access to the internet and send large files across the network. The Zonet ZEW1642 is based on the Ralink RT2860 series wireless chipset. I installed the Zonet ZEW1642 in a new computer with Win7, and I’m using the Linksys WRT160N wireless router on my wired computer. Unfortunately, the Zonet doesn’t seem to work with the Linksys security. The card picks up the signal loud and clear, but when I type in the security key, it says it’s the incorrect password. I’ve talked exhaustively with the techs at Linksys, who concluded that the fault lies with the wireless adapter card and not with the router. I would accept this, except the card is able to pick and log into my neighbor’s wireless (he gave me his password to let me test the card out). So I’m trying to find the most recent drivers for the ZEW1642 to see if there is a kind of Win7/Linksys/Zonet conflict here.